Need I mention Alec Baldwin, Lady Gaga, Harvey Weinstein, the Kardashians, Christian Bale... and my very own doppelgänger, Howard Stern? Which is to say that after a lengthy career toiling in the dungeons of music (rock-band performances at CBGBs, recordings at Electric Lady), television (Emmy Award), and, lately, film (screenplay optioned by Danny Devito), I’ve developed a very thick skin and a willingness to plunge headlong into the unknown, brushing aside or knocking down obstacles in my path, and taking on jobs and responsibilities for which I was eminently unqualified. Which brings us to DrupalCon Austin. At my initial interview for the copy editor job at Drupal Watchdog, I was careful to explain that, although familiar with the open source movement and knowing what Drupal was for, I neither wrote code nor had the foggiest notion about how to build a website. On the other hand, I could put stuff into good English. Merely a few Watchdog issues later (and still Drupal-ignorant), I decided I should have my very own website and, of course, it should be built on Drupal. That evening, on my third martini, I fired off an e-mail to Jeremy (Jeremy Andrews, Drupal Watchdog publisher) proposing I write an article about a Drupal newbie who embarks on his very own website. Jeremy was encouraging and so “Baby Steps” was born. Naturally, the article was in the form of a screenplay. It starred a character named Ronnie Ray – a martini-drinking, somewhat clueless (but somewhat aggressive) screenwriter. After he read it, Jeremy laughingly mentioned that my article was surely the first time in history that the words “Drupal” and “post-coital” had been uttered in the same breath. He also requested that “Baby Steps” become “Baby Steps #1”; the first of a regular Watchdog column. Desperately Googling material for “Baby Steps #2,” I stumbled across the Drupal Association website and the template for a “Letter to Your Boss,” explaining why it was important to send you to DrupalCon Austin. Hey, I already knew why it was important send me to Austin: a great music scene, a plethora of hipsters, and terrific craft beers. Within weeks I was on my way to Austin. Okay, here we are, Austin! But by Tuesday morning, after Dries’ opening remarks and after attending a session about Drupal something-or-other, it became painfully clear that, Drupal-wise, I had blundered too far, too fast, too deep. On the positive side, everyone I encountered seemed of boundless good cheer and enthusiasm; there were smiles galore and everywhere you turned small knots of people with DrupalCon name-tags and Drupal t-shirts congregated, introduced themselves, and engaged in animated conversations. Plus there were the perks: Free yummy lunches! Open-bar parties! Funky little music clubs with no cover or minimum! Jazz! Blues! Rock! Wow, I was loving Austin. Yet meanwhile, the question kept burning into my guilty, hung-over, coffee-stoked brain: How do I justify my existence here? Jeremy readily agreed, showed me how to set my iPhone to record, and I was off to the races. 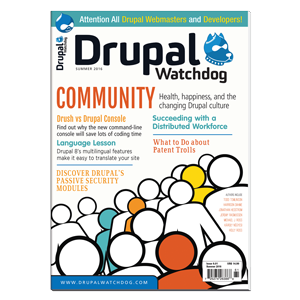 What about in the next issue of Drupal Watchdog? * Look for “Baby Steps #3: Lost in Austin” in the next issue of Drupal Watchdog, arriving late-September – in time for DupalCon Amsterdam.